<="" source=""><="" source="">Your browser does not suppport the HTML5 audio element. During three years of observations, HETDEX will collect data on at least one million galaxies that are 9 billion to 11 billion light-years away, yielding the largest map of the universe ever produced. The map will allow HETDEX astronomers to measure how fast the universe was expanding at different times in its history. Changes in the expansion rate will reveal the role of dark energy at different epochs. Various explanations for dark energy predict different changes in the expansion rate, so by providing exact measurements of the expansion, the HETDEX map will eliminate some of the competing ideas. HETDEX will study baryonic acoustic oscillations — "sound waves" from the first 400,000 years of the universe. In those early years, the universe was a dense "soup" of particles of matter and particles of energy. Disturbances created sound waves that rippled across the dense universe. At 400,000 years, the universe became cool and thin enough that the ripples created during the Big Bang became frozen at a unique size. Special telescopes on the ground and in space have measured the "crests" of the ripples in the early universe, like the peaks of the waves that roll away from a stone thrown into a pond. The peaks of these waves formed a basic yardstick. As the universe has expanded, that yardstick is maintained, although it grows with the expanding universe. HETDEX will find this yardstick by measuring the distances between galaxies at different times in the early universe. Careful mathematical analysis of its map of distant galaxies will reveal how the yardstick changed with time, telling us the size of the universe at different epochs. Comparing the size and expansion rate at different times in the history of the universe, which are influenced to different degrees by the "repulsive" force of dark energy, will reveal the true nature of dark energy. 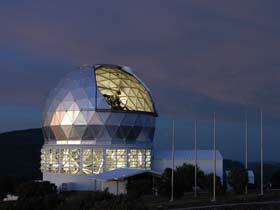 HETDEX will produce its map by using a set of 150 spectrographs mounted on HET. They are known as VIRUS — Visible Integral-Field Replicable Unit Spectrographs. Each unit will be identical to all the others, making it possible to build them in less time and for less money than a single giant spectrograph with the same capabilities. These units will gather the light from distant galaxies and split the light into its individual wavelengths, known as a spectrum. A spectrum reveals an object’s chemical composition, its temperature, and how fast it is moving toward or away from us. For distant galaxies, astronomers can convert its motion away from us into its distance, producing precise 3-D maps. HETDEX will search a large area of the sky that encompasses most of the Big Dipper. This region is far above the plane of the Milky Way galaxy, which is filled with clouds of gas and dust that block the view of distant galaxies. A prototype of the VIRUS spectrograph has undergone significant testing with excellent results. 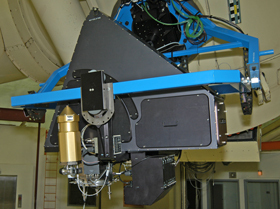 Major modifications are being made to HET to expand its view of the sky, allowing HETDEX to see hundreds of galaxies at a time. Current plans call for full data-gathering operations to begin soon, with the survey completed three years later — long before any other dark energy experiment has completed its work. HETDEX will thus provide the first major test of dark energy, and the first volleys in an exciting scientific revolution.